A rock band with a career of more than 30 years. Debuted in 1976. The current lineup consists of Keiichi Suzuki (Vo., Gt. ), Toru Okada (Key, Cho), Masahiro Takekawa (Violin, Trumpet, Cho), Tetsuro Kashibuchi (Dr., Cho), Hirobumi Suzuki (B., Gt., Cho), and Ryoumei Shirai (Gt., Sitar, Gitagidora, Cho). The band was formed in 1975, from the early 70’s hit group “Hachimitsu Pie”. 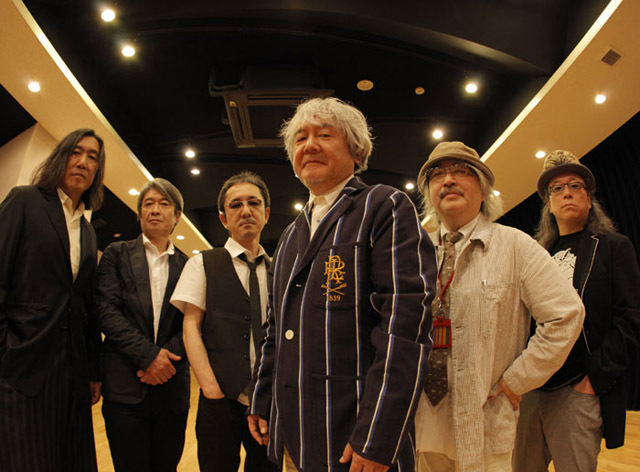 In 1976, made their major debut with “Hinotama Boy” under the name “Keiichi Suzuki and Moon Riders”. In 1977, released their first album “MOONRIDERS” under the name Moonriders, and have been releasing constantly since then. They took a break for 5 years from the year 1986, but became active again with the 1991 release album “Saigo no Bansan”. Their ambition to always incorporate new sounds has influenced many artists of all generations. Although taking a breaking since 2011, members have been active with solo works, producing, and providing songs to other artists.